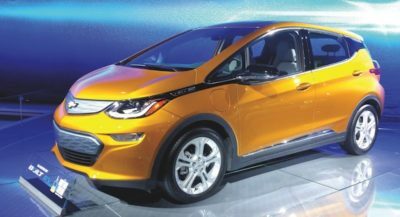 CHEVROLET BOLT is the gold standard of new electric vehicles, with a 238-mile range and a $37,000 base price. There was a time when the Los Angeles Auto Show showcased the U.S. land yachts that cruised along the highway lapping up 10-15 mpg with a V8 or 6. “Foreign cars” saw an opportunity and slowly infiltrated the U.S. car market with small car technology squeezing out 20 to 30 mpg from their efficient four bangers. Fast-forward to the 2016 Los Angeles Auto Show at the Los Angeles Convention Center showcasing 2017-2018 models flaunting over 100 mpg-e. The “e” is for interpreting miles-per-gallon with electric power. A Millennial favorite, the VW Golf, is riding the trend offering an e-Golf option touting a 120-mile range on one battery charge or 116 mpg-e. Toyota showed off its hydrogen powered Mirai with a fuel cell power plant compressing hydrogen gas into electricity. Also in its alternative fuel stables are: a Prius hybrid electric/gas option, a plug-in hybrid version and a plug-in battery electric vehicle (BEV, as the insiders call all-electric cars). Early Toyota Prii squeezed out an 11-mile range on battery power alone, just in case your 52-mpg gas sipper ran out of fuel. Then along came the upstart Nissan Leaf, world’s best selling all-electric, moving 250,000 units since 2011. Originally, the Leaf topped 84 miles on a single charge, now it’s 107, but the 2018 model promises over 200 miles per hook-up. BMW continues with its boxy line of all-electric I3s sporting a 114-mile range, and dreamers can purchase the stunning 155-mph Bimmer hybrid I8 plug-in starting at $150,000. Tesla is still the home for top battery range at 310 miles on one lithium ion battery charge, but Tesla is being challenged by stylish Jaguar, which jumps in with their first production battery powered car, the i-Pace, sporting a 220-mile range. Also in 2018, Audi counters with their e-Tron upgrade announcing a 250 mile / charge and a plan for nationwide charging stations. Much more affordable, the Chevy Bolt BEV, the current gold standard with a 238-mile range, is less than half the price of these electric-luxos ($37,000 before incentives) and is standing up to Tesla’s upcoming Model 3. New technology has not only birthed new electrified power trains, but for the first time, a manufacturer will build a car by printing it with 3-D printers using aluminum and titanium. Divergent 3-D’s “Blade” claims low emissions comparable to the electrics. These 700 hp beasts will be available in 2017 and can zip from zero to 60 in 2.5 seconds. Was that with a V8 or a 6… or does that even matter anymore?